Unless you go through that one rejection in your life, you don't realize how passionate you are about your dream career. 1. An American writer of novels, poetry and plays, Gertrude Stein's (1874-1946) book "The Autobiography of Alice B. Toklas" became a literary bestseller in 1933. Arthur C. Fifield turned down Gertrude Stein's manuscript for "The Making of Americans" in the rudest way possible, without even reading the whole of the script, he made a mockery of her writing in the letter. 2. Madonna Louise Ciccone (1954), an American singer-songwriter, actress and entrepreneur, has remained one of the most prominent cultural icons for three decades now and has set a great example for women in the entertainment industry. Although her debut album sold more than 10 million copies worldwide after she signed with Sire Records in 1982, she received this rejection earlier from a producer who didn't think she was ready 'yet'. However, Madonna turned this rejection into motivation. 3. Stieg Larsson (1954-2004), Swedish Journalist and Novelist, was the second best-selling author in the world for 2008, first was Khaled Hosseini. Steig's the man who wrote the award-winning"Millennium" trilogy. This swedish letter from Stockholm tells Stieg that he's not good enough to become a journalist. 4. Kurt Vonnegut (1922-2007), an American writer, was known for his humanist beliefs and he was the President of the American Humanist Association. The New York Times gave him the title "the counterculture's novelist" at the time of his passing. He sent three samples of his writing to the Atlantic Monthly in 1949 but all of them got rejected. However, they deemed his work to be commendable but just not compelling enough to accept it. Kurt framed this letter that now hangs in his Memorial Library in Indianapolis. "Slaughterhouse-Five", his most famous work, is said to have developed out of the three rejected samples. 5. Edgar Rice Burroughs (1875-1950), an American writer, was famous for creating the jungle hero 'Tarzan'. 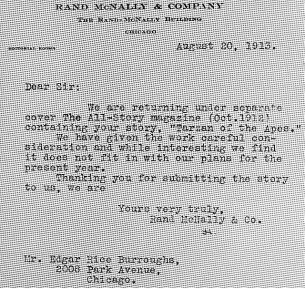 In 1912, an (unfortunate) magazine rejected his story "Tarzan of the Apes" that actually went on to have 25 sequels and countless reproductions after a smart publication accepted his piece. 6. Sylvia Plath (1931-1963), an American poet, novelist and short story writer, won a posthumous Pulitzer Prize for her "The Collected Poems" in 1982. This letter wasn't exactly a rejection, it was just a humble beginning for Sylvia's career even though she was a great writer. 7. Tim Burton (1958), an American film director, producer, artist, writer, poet and stop motion artist, has won endless awards for his films. After he got this rejection from the Disney editor, he became adamant on working on his skills to get accepted by the company and he did get selected as an animator's apprentice just a few years later. He got involved in films like "Edward Scissorhands", and "The Nightmare Before Christmas"
8. U2 (formed in 1976), an Irish rock band from Dublin, broke the record by winning 22 Grammy Awards (more than any single band has ever won) and they performed in the highest grossing concert tour in history. RSO Records was not impressed by U2's debut album in 1979. The band went on to sign with Island Records soon after and released their first international single, "11 O'Clock Tick Tock." They went on to selling 150 million records worldwide. 9. Jim lee (1964), a Korean American comic book artist, writer, editor and publisher and the co-publisher of DC comics, is one of the most famous faces in the comic book industry. Out of the many rejections he received in his life, this one was from Marvel who asked him to 'reapply' after he had learnt how to (basically) write and draw. 10. Andy Warhol (1928-1987), an American artist, was a leading figure in the visual art movement known as pop art in late-1950s. Andy offered one of his paintings to The Museum of Modern Art in 1956 free of cost but they were unimpressed and quickly rejected it. The tables turned fast enough for Andy; on top of owning a museum in Pittsburgh today, The Museum of Modern Art features 168 of his original artworks.